Intel's premier consumer desktop platform looks rather more tasty now that the chip giant is rolling out the £250 Core i7 3820 processor in the coming weeks. The goliath LGA2011 processors, of which there are now three, need an X79 motherboard for support; no other supporting core logic will do. 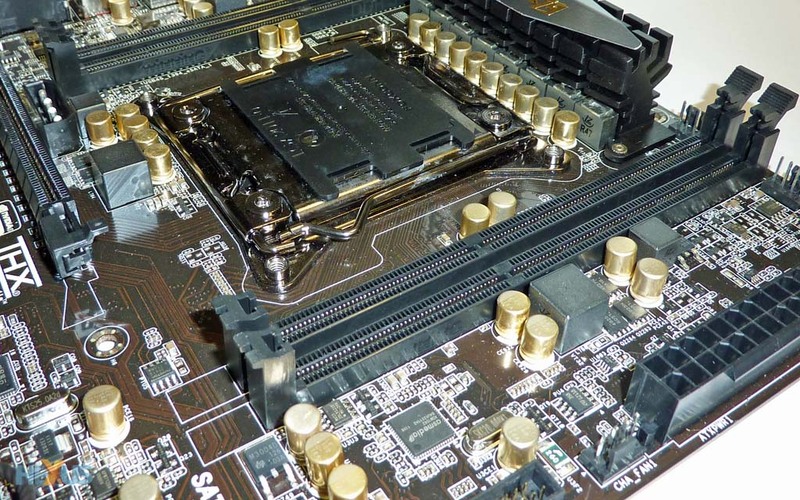 Yet selecting the right X79 board is crucial once you factor in the £170-plus outlay. 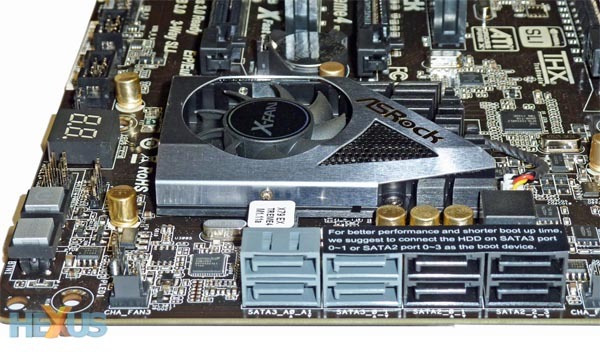 Making a concerted move into the enthusiast space in 2011, ASRock, formerly part of ASUS, is keen to carry on the good work in 2012. Part of six-strong line-up of X79 boards is the Extreme 4, currently retailing at £175 or so. This may sound exorbitant for folk who are used to sub-£100 boards, but actually represents entry-level pricing for Intel's beefiest chipset. Presented in a standard ATX form factor though also available as an mATX board for a tenner less, ASRock hasn't skimped on features. Digital power management (a nod towards ASUS, perhaps? ), Japanese capacitors, high-quality audio, four-way CrossFireX and three-way SLI support, debug LED, USB 3.0, eSATA and FireWire all make it on. The board feels roomy and easy to work with from an installation perspective, and one reason rests with ASRock decision to use four memory slots rather than eight we've seen on other manufacturers' boards. LGA2011 processors feature a quad-channel memory-controller architecture that's optimally connected to sets of four DIMMs. We actually have little problem in ASRock dropping down to four DIMMs; 16GB (4 x 4GB) DDR3-1,600 kits are readily available for £65 and there's enough capacity to sate most users' needs. If not, other boards in ASRock's arsenal do feature the full complement of eight slots. By the way, the board can run memory at a blistering 2,400MHz while leaving the CPU at default speeds. There's a chunky heatsink just to the right of the socket but it doesn't interfere with cooler mounting. We like the fact that it's screwed in; most budget boards tend to have flimsy push-pins. There seems to have been genuine thought gone into the layout, from the side-angled 8-pin CPU connector to three fan-headers close together along with a front-mounted USB 3.0 connector, which, again, is another nod to how ASUS implements it. Move on down and the six right-hand ports run off the Intel chipset (2 x SATA6, 4 x SATA3) while the left-hand duo are powered from an ASRock-added ASMedia controller which also runs the SATA6 connector next to the USB3.0 front header and eSATA3 port on the back. We're not convinced of the need for a fan on the 'southbridge,' and, while it can be unplugged from the board, there is no way to switch it off in the BIOS. Power and reset buttons and the debug LED are always handy for us tinkerers and we're pleasantly surprised that they've all made it on this low-priced X79 board. The LGA2011's 40 PCIe Gen3 lanes are a boon for users who need lots of bandwidth for multiple video cards. 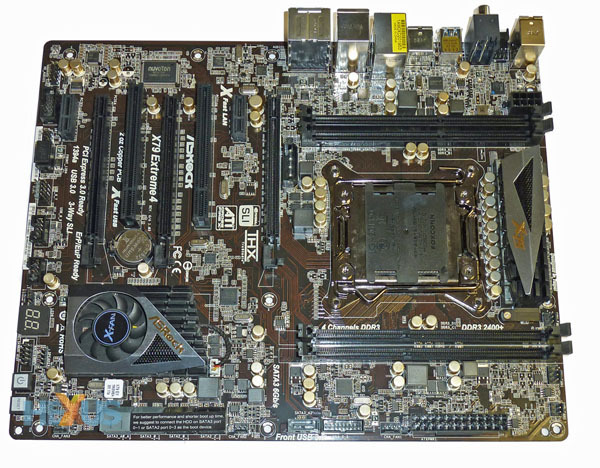 ASRock arranges the board with three mechanical x16 slots that work at x16, x16 and x8 electrically. 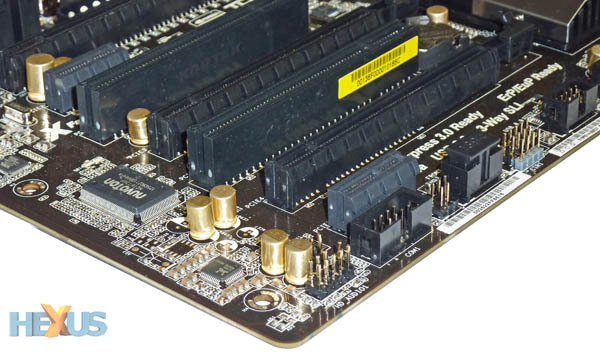 The Extreme 4 touts four-way CrossFireX usage, but we're inclined to think that's more for marketing than real-world usage; you would need to install a fourth card into a PCIe x1 slot, of which the board has two, along with two PCIc. Interestingly, ASRock has to add a controller to specify PCIc; Intel's X79 is shorn of it. Really, you're limited to three cards, either SLI'd or CrossFireX'd, for gaming purposes, but ASRock does the right thing and leaves at least a slot's width between each x16. Just above the primary x16 slot sits a 4-pin Molex connector, ostensibly for adding more power when graphics duty calls, though we haven't seen it on too many other X79 boards before. The Realtek ALC898 7.1-channel audio CODEC offers a decent spec. and can be outputted by analogue and digital means. We appreciate the clear CMOS button next to the PS/2 ports, and six USB 2.0, two USB 3.0, FireWire, and Broadcom-powered Gigabit LAN make this a well-rounded I/O section. ASRock's used sensible thinking in delivering a well-featured X79 motherboard that retails at the low end of the spectrum. Chopping four DIMM slots saves cash that's reinvested in carefully-selected features. Overall, ASRock's got the balance right for this £175 board, and there are very few things we'd change.